All performance coaches have one desire, to create the ultimate athlete. One that is powerful, yet resilient according to the physical demands of their sport. This athlete, when prepared appropriately, will be capable of achieving optimal performance at specific, critical times during the competitive season. Optimal performance is only possible when each of the six physical performance qualities required in the competitive event, which are described below, are improved, or peaked, to the fullest extent possible. For the majority of team sports the “desired time” for optimal performance includes post-season and championship play. However, due to the length of a typical season, with multiple competitions within that timeframe, high-level, or near optimal, performance must also be achievable on a weekly basis for all athletes. Autoregulated training sessions, particularly later in the week, can be implemented to guarantee high-level performance is available for each competition throughout the season. This method is implemented further to ensure true optimal performance is available during post-season and championship play, giving every athlete within the team a competitive edge over their competition. Prior to the demonstration of the hybrid training model, a method implemented during the competitive season to ensure optimal performance remains possible, it is necessary to discuss the foundation of this training model. The foundation of this in-season training model is the comprehension and specific implementation of the six physical performance qualities during training. When broken down, the six physical performance qualities include the three energy systems (Oxidative, Glycolytic, and ATP/Cr-P), Strength, Repeat-Power, and Speed. To the majority of performance coaches, the training of these qualities are not new concepts by any means; however, their importance cannot be overlooked in training. 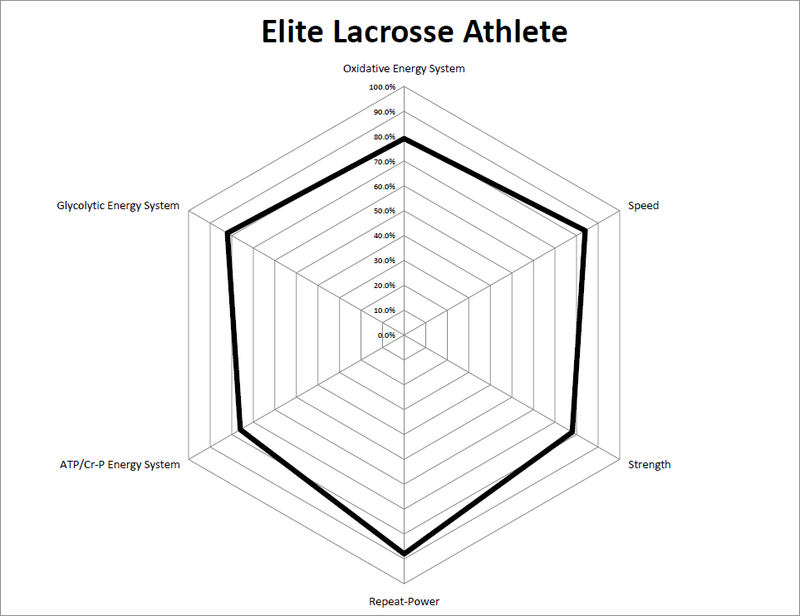 These skills are demonstrated for an elite lacrosse athlete in figure 1.1 below. It is important to note again that every sport will require each of these qualities to a different extent, and thus must be trained specifically to their requirements. Many performance coaches may look at this and think, “of course there are more physical qualities that are required in sport than just these six.” Yes, there are many more performance factors and skills that must be considered and trained. However, each of those skills fits into one of the six physical performance qualities. The ability to repeatedly sprint for the entire duration of a competition is determined upon the training and conditioning of the three energy systems as well as the repeat-power quality. Skills such as change of direction and agility fall within the strength and speed physical performance qualities. Every performance coach must prepare each athlete with proper training of these six physical performance qualities throughout the entire annual program. As a performance coach, it is critical to have the knowledge and understanding of these stressors, as well as the ability to manage the stress placed on every athlete. A simple way to view the stress being applied in training is to consider training on a continuum. If stress is applied at an extreme amount with limited recovery, the athlete will be unable to cope with the excessive levels of stress and begin to respond poorly. 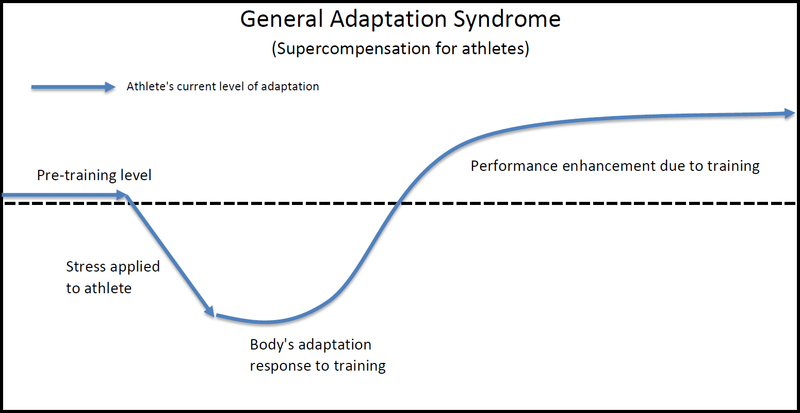 At the opposite end of the continuum, if not enough stress is applied during training, the desired training adaptations will not occur and optimal performance will never be reached. In either case, too much or too little stress in the training process will hinder the improvement of the desired performance qualities and limit the transfer of the skills onto the playing field. Managing and balancing stress is a crucial aspect of every performance quality required in competition, particularly during the competitive cycle when high or optimal performance is required regularly. Figure 1.2 below displays the continuum used for appropriate training. This general understanding of appropriate stress implementation is critical as training programs, or the physical stress placed on an athlete during training, which are the most controllable stressors to a performance coach, are implemented during the competitive cycle. No performance coach or program will ever “win” a team a national title. However, a program and/or performance coach does have the ability to lose one if inappropriate amounts of stress are applied, as this would lead to athletes that are unable to compete at the highest levels come game day. It is critical for every performance coach to realize and understand they are ultimately a “stress manager” and must account for all stressors an athlete endures when creating and implementing a training program. This ability will allow the autoregulation of in-season training to be utilized to the highest extent, which ultimately allows optimal performance. Optimal performance, or the peaking of each physical performance quality as described above, is only possible when methods implemented maximize transfer of training. The goal of this article is to provide a simple, yet highly scientific approach to allowing optimal performance to be achievable for every athlete. The application of appropriate stress and its outcome in performance can also be seen in the simple General Adaptation Syndrome (GAS) provided in figures 1.3-1.5. Each of these three results are determined based on the stress continuum shown above in Figure 1.2. The first figure, Figure 1.3, displays the improvements possible when stress is applied in an appropriate amount for the desired adaptation, which leads to improved performance to the fullest extent. The second figure, Figure 1.4, shows the results of an athlete that is stressed using insufficient means in training. This training method results in a poor training response and no performance gains due to the training applied. The final figure, Figure 1.5, represents the results of an over-trained athlete, or one that has experienced excessive levels of stress. When this approach is implemented during in-season training, the athlete’s body does not have the resources or capabilities to adapt to the demands being placed upon it in training. Thus, a negative, or poor, training response occurs and an athlete will end in a worse performance state than pre-training levels. The final two examples (Figures 1.4 and 1.5) must be avoided by performance coaches at all costs. 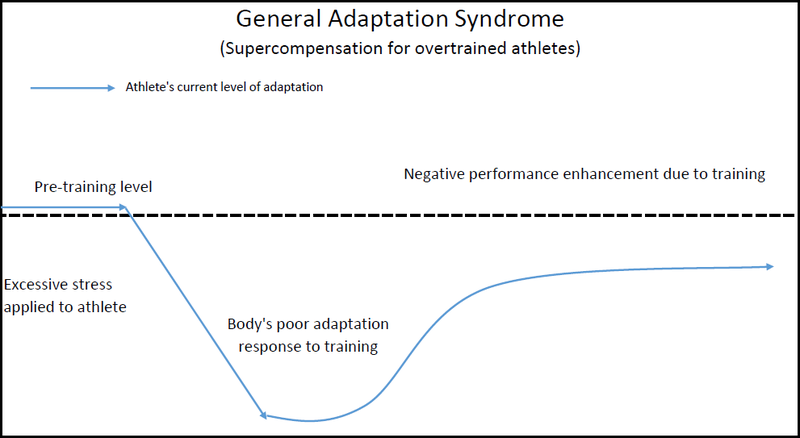 If either of these two occur at any time within the in-season training cycle, an athlete will be left either undertrained or with a negative adaptation, leading to a less than optimal state of performance. Ultimately, the goal of in-season training should boil down to the concept of applying appropriate stress to maintain or improve performance, while allowing recovery so optimal performance remains possible. Once the six physical qualities and appropriate stress are understood, each of these principles must be applied specifically within training for optimal performance to be achieved. This becomes especially true during the in-season training block, as many team sports, such as lacrosse, require athletes to compete at a high-level each and every week. This in-season training, or hybrid training model, approaches training much differently than off-season training. During the off-season, the block training model, which trains one, or possibly two physical qualities within each training block, is implemented. This training allows for increased stress levels to be applied, and leads to greater adaptations to be realized in each physical performance quality once it has been trained. 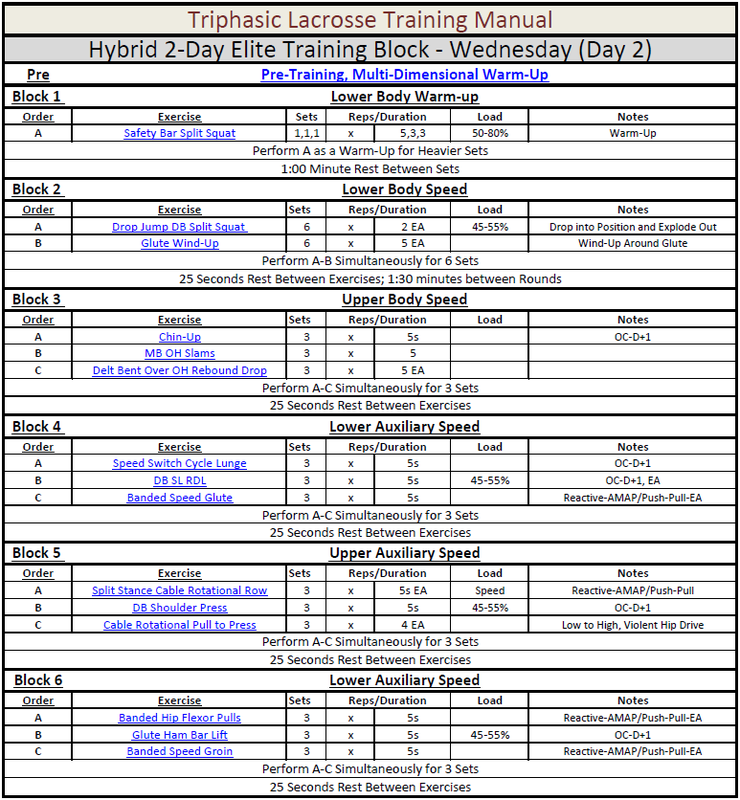 For more information on the block training method, click here. However, during the competitive season, which requires high-level, or near optimal, performance on a weekly basis, the hybrid training model becomes required. Unlike the block training model, the hybrid model trains multiple physical performance qualities simultaneously based on their compatibility. The hybrid training model does reduce stress experienced by an athlete when compared to the block training model, as multiple qualities are trained within the same day. However, as the goal of the in-season training block is to allow athletes to compete at a high-level repeatedly, the hybrid model does ensure each quality is, at the very least, maintained in a highly trained state. Once again, the hybrid training model is implemented with a much different goal than off-season training. Every performance coach must understand these differences in programming as they each achieve a different outcome. The compatibility of the physical performance qualities is also considered throughout the implementation of the hybrid training model. The undulation of specific training stressors, which follow this compatible adaptation system during the course of a week, allows every physical performance quality to remain in an optimal performance state for an indefinite amount of time, as long as appropriate stress and training continuously applied. The concept of compatible adaptations is understood based on the responses of the body by each performance quality during training. Up to this point, only the specific stress to an individual performance quality during a workout has been covered; but, it is necessary to remember the human body functions as one single unit. Based on the compatible adaptations model, multiple qualities, which must be interrelated, or compatible, have the ability to be trained within the same training session. By training the performance qualities that are compatible during training, multiple adaptations are able to be realized within the same training session. Training with the idea of compatible stressors allows optimal performance to be maintained for a greater duration than if each compatible quality was trained individually throughout the competitive season. It is important to realize that the qualities that do not fall into this category of compatible training will hinder training to a greater extent if they are trained within the same session. The training of these “non-compatible” qualities will lead to decreases in performance abilities, ultimately wasting effort and training time. These compatible stressors become clear when the requirements of each quality to be improved maximally are well understood, along with the response that occurs within the body due to specific training. However, in this article we will avoid this physiologically dense material and focus more on the implementation of appropriate, compatible adaptations to maximize results for each individual. This goes back to the principle of applying appropriate stress. The hybrid model also fits the goals of in-season training as sport practice time increases while volume in the weight room is reduced. This allows athletes to continue to improve their physical performance qualities in the most specific manner possible, on the playing field. 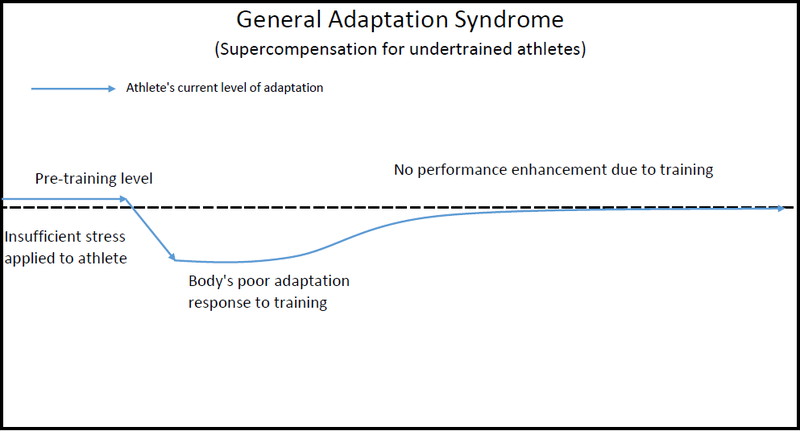 However, even with the reduced number of training days, this training model can be applied to ensure each of the physical qualities remain in a highly adapted state. The majority of teams only train for two, maybe three, days throughout the competitive season. This means every performance coach must find a method that not only stresses each of the physical performance qualities, but also allows recovery from stress to allow near optimal performance on a weekly basis. For this reason, the hybrid training model has been created to ensure every athlete has the physical capability of performing at the highest levels come game day. Here at Denver, we are fortunate to play consistently once per week. This allows a systematic training program, such as the hybrid training model to be implemented and regulated to a high-extent. This weekend competition schedule allots two training days for our lacrosse team. These two training days occur on Monday’s and Wednesday’s throughout the season, unless our typical weekend competition schedule is changed. For the remainder of this article Monday and Wednesday will be referred to as Day 1 and Day 2 training days, respectively. As competition occurs at the end of the week, training implemented on Day 1 is typically of a higher stress than Day 2. Different qualities are also trained within each of these days according to the compatibility of qualities. Day 1 focuses on the improvement of the strength and power qualities, while Day 2 places a large emphasis on the speed performance quality. This training allows all ranges of the force-velocity curve to experience stress, with Day 1 focusing on lower speeds and higher loads, and Day 2 improving performance at higher speeds and lower loads. 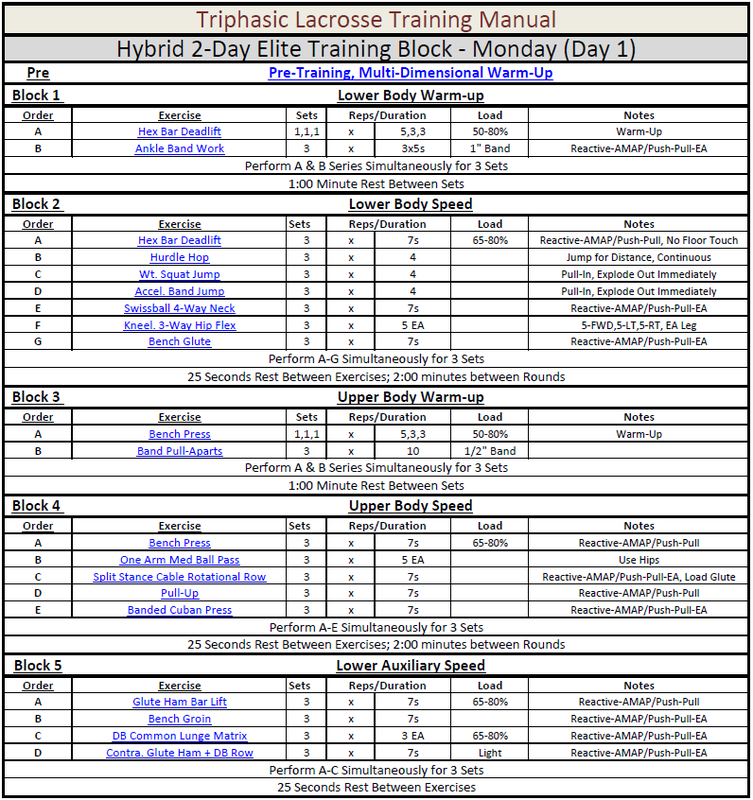 As sports are played at high speeds, this sequencing of the hybrid training also progress athletes from general to specific, with Day 2 serving as a “neural preparation” day for the upcoming competition. Each of these training days are represented below in figures 1.6 and 1.7, respectively. To view an annual plan, including every training day completed for the entire year, click here. Through the implementation of the hybrid training model, athletes are able to continue to stress and maintain each physical performance quality to a high extent while continuing to compete at, or near, optimal levels. Off-season training, or the block model, is implemented to maximize each individual physical performance quality to the highest extent. However, once the competitive phase begins, training goals shift to maintain and/or improve of each of the six qualities on a weekly basis, which requires the implementation of the hybrid training model. If a coach attempted to implement the block training model during the competitive season, only certain physical performance qualities would be stressed and adapted on a weekly basis to the highest extent and optimal performance would not be possible for an extended period of time. Since team sports require multiple competitions throughout the season, this is not an ideal training model to implement at this time. Once again, it is critical performance coaches remember they are stress managers with the ultimate goal of improving performance in every athlete’s respective competitive event. By training athletes using compatible qualities and prepping their nervous systems for competition, all physical performance qualities can be accounted for and maintained. This in-season model allows the appropriate maintenance of each of the qualities in a systematic, efficient manner, ultimately leading to optimal, or near-optimal, performance being available on a weekly basis at the required competition times. The hybrid training model, although exceptional for ensuring all physical performance qualities remain in a highly trained state for the duration of the competitive season, still does not consider the levels of stress athletes are experiencing. Appropriate stress application continues to be the most critical aspect of performance. As described above, every athlete experiences increased volume of practice during the competitive phase. During the in-season block, athletes also experience increased travel to competitions, the continued stress of academics and other personal factors, along with greater psychological stress as they are typically under pressure to perform at a high-level. At Denver, each of these concepts are applied to allow the autoregulation, or the variation, of stress experienced by a team throughout the week. With the volume and intensity of practice varying, both within the week and on a weekly basis, this stressor must be understood and respected by all coaches. Travel is another variable that must be considered to a large extent, particularly for Denver lacrosse. We compete in the Big East conference for lacrosse, meaning we are flying regularly to the east coast, which is typically about a three plus hour flight across two time zones. Last year alone we traveled nearly 25,000 miles throughout the season. This is significantly higher than many other programs and creates increased wear on an athlete required to compete repeatedly at a high-level. Academic and personal life stressors must also be considered, specifically mid-term and final exam weeks. Finally, psychological pressures to perform to a high-level, whether from the athlete themselves, coaches, parents, or anyone else, must also be considered as a stressor when creating a training program and the appropriate stress levels required. When each of these stressors are well understood, a performance coach has the ability to predict, to some extent, the difficulty of the upcoming competition. At Denver, we begin the year with these predictions for each competition based on specific, pre-set, parameters. These parameters, in order of their importance, include the opponent ranking, number of days between competition, and travel. Each of these variables are utilized to determine the “predicted training load” a player is expected to experience. Clearly there is no specific unit involved in this process, however, this process does provide a numerical system to quantify the expected loads on different weeks. Through the completion of this calculation together, both sport and performance coaches have the ability to understand which weeks are more or less difficult. Ultimately realizing when the appropriate stress must be decreased or increased, respectively, depending on each weekly prediction. By taking these aspects into consideration a training program, based entirely on how prepared a team is to be stressed, yet still recover and perform at the highest level can be created and implemented. As a performance coach, it is always important to remember we must “control what we can control.” Many of these factors, such as travel, academics, and personal factors are entirely out of our control as coaches. To some extent, depending on the relationship a coach has with their sport coaches, stressors at practice can be controlled. However, this is relatively limited even in the most well communicated circumstances. This leaves the stress implemented in training, specifically the weight room during the in-season block, as the most “controllable” factor available to a performance coach. A critical aspect every performance coach must “control”, to the greatest extent possible, is the nervous system readiness of an athlete. The majority of the physical performance qualities will only vary slightly in their adaptation throughout the week. Take strength for example, as a single week progresses, the ability of an athlete to complete a high percentage repetition will not decrease to a great extent. Your athletes might not appreciate the implementation of this program, but they will be capable of completing strength work at high loads as the muscles remain in a relatively similar trained state throughout the week. However, this is not the case for an athlete’s “nervous system readiness”, which can vary greatly throughout the week based on the stressors, particularly volume, experienced by an athlete. An athlete’s “nervous system readiness” represents the ability of an athlete to output high neural drive in explosive movements and most closely represents the speed physical performance quality. This change in neural drive can be seen throughout the week in the ability of an athlete to sprint at maximal velocities. As the volume of the week accumulates, every athlete’s ability to execute a sprint at these high-velocities is reduced to a much greater extent than the ability to complete a high-load repetition. As almost all athletic movements and competitions are completed at the highest velocities, it is absolutely critical that every athlete have the highest “nervous system readiness” possible. Only when this skill is available to them can a team compete at an optimal, or near-optimal, state in each of the physical performance qualities. The nervous system or “nervous system readiness” is key for high end performance and must be accounted for and monitored by all performance coaches. At the University of Denver, we have implemented a simple, quick, yet now proven, method to determine an athlete’s “nervous system readiness”, a hands-on-hips, countermovement jump. A jump mat is used to increase efficiency and allow testing of multiple athletes to be completed quickly. A meta-analysis, which confirmed this style of jump to determine “nervous system readiness”, of this jump testing method was recently completed. To read this newly published article, click here. With the knowledge that this jump method is directly correlated to the ability of an athlete to produce high-neural drive efforts, a performance coach can easily control the stress levels experienced throughout the week and autoregulate according to their specific needs. Returning to the concept of stressing an athlete while still allowing recovery for optimal performance and the implementation of the weekly training program demonstrated earlier, the testing of an athlete’s “nervous system readiness” would be most appropriately applied on Day 2 of training. This is because the speed physical performance quality, which places the greatest amount of stress on an athlete’s nervous system occurs on this training day. Through the countermovement jump testing described above, I am able to quickly determine how prepared the team is to tolerate stress, specifically volume, and still recover for the upcoming Saturday competition. Now that each of the concepts, which all play critical roles in the utilization of the in-season autoregulation of training are understood, coaches can implement this technique to allow optimal performance throughout the entire competition season by managing stress appropriately. As with any testing protocol, a baseline must first be established. As the goal of the hands-on-hips, countermovement jump is to determine an athlete’s “nervous system readiness”, this baseline must be executed when an athlete is in a non-fatigued state. At Denver, we complete this testing early in the week, prior to any practice or training session. It is critical this baseline testing accurately depicts an athlete’s maximal available power and effort as it is this number that dictates all in-season training volume. At Denver, we were able to complete the baseline jump mat testing for every individual (45+ athletes) in a matter of thirty minutes. This makes testing for this important performance variable simple and possible for all teams. Once the baseline for every athlete has been determined, it becomes simple to re-test the jump mat. At Denver, with the number of athletes on the lacrosse team and limited training time in-season, ten athletes were selected to represent the “nervous system readiness” for the team. If testing took thirty minutes every day, this method would not be efficient or even possible to implement effectively. Figure 1.7 below represents these ten athletes’ baselines, and weekly scores throughout the duration of the in-season training. At the bottom of the figure, average jump height for the ten players, along with the percent change from the baseline average and week to week percentage change is calculated. This allows a coach to easily view trends and make adjustments as necessary. These percent changes were selected due to the goal of measuring “nervous system readiness”, which requires the highest-quality of training. If the nervous system is not capable of producing high-velocity efforts, then there is no reason to attempt to train the speed quality. For this reason small drop-off’s, of up to 10% were measured. Based on the performance in the jump testing, training volume for the Day 2 session can be determined. If the majority of the team displays a decrease in their “nervous system readiness” on the Day 2 of training, a performance coach must not add more neural stress from the training session. This is where this science becomes more of an art form. Every coach must understand all of the stressors their athletes are experiencing, and then determine how much more stress from training, which is the most controllable source, the team can handle while still performing at least at a near-optimal state. Through the implementation of this weekly testing, physical preparedness, allowing an optimal state performance becomes possible. This is demonstrated below in figure 1.8, which demonstrates the change in the average jump performance for the ten test athletes on Day 2 (Wednesday) throughout the duration of the competition season. Recalling that the baseline average for the ten athletes was 25”, nearly every testing day is below this jump height, meaning the athletes are not in an optimal state of performance in regards to their “nervous system readiness”. However, it must be realized these results are from a Wednesday, not on a competition date. These athletes still have Thursday and Friday to recover prior to the Saturday game. Recovery during this time will also be improved as the volume and intensity of practice decreases as more schemes are implemented with the upcoming competition. This graph can be implemented by all coaches to understand where the team is and how much stress they are able to withstand, while still recovering for the upcoming competition. For example, weeks 7 and 8 represent a high-stress time for our athletes. During this time volume implemented on Day 2 would be reduced by multiple sets, or even a download day could be given. Consider the graph in figure 1.8 like the GAS graph shown in figure 1.3. As jump height decreases, an athlete is dropping below their “pre-training level”, or baseline. A performance coach must rapidly recognize this and apply the appropriate stress required to allow recovery, leading to optimal performance. If a coach were to continue to stress an athlete during Day 2 training, an athlete would be unable to recover and their performance would reflect that of figure 1.5. Every coach must understand all of the stressors their athletes are experiencing, and then determine how much more stress from training, which is the most controllable source, the team can handle while still performing at an optimal state. Through the consideration of the weekly “game load” as well as the team’s current “nervous system readiness”, a performance coach can quickly test and implement a specific training volume based on their athlete’s needs for that individual week. When this method is implemented appropriately, it is possible to not only maintain, but improve an athlete’s ability to perform throughout the duration of the competition phase. This can be seen as the average jump height increases above the initial baseline testing, which was completed in a non-fatigued state, during the final few weeks of the season. However, only when each of these factors are utilized appropriately, does optimal performance become possible consistently for the entire duration of the season. For more information on the specific, systematic training completed at the University of Denver, including the six physical performance qualities, the implementation of the block and hybrid training models, an entire annual program laid out for every training day, and much more, click here.